The other night in our house there was a lot of drama. By drama I mean yelling, screaming, crying, real tears, and proclamations of a ruined life. All of this was over the fact that my daughter is the only human in our household that doesn’t have blue eyes. Apparently, blue eyes work with more make-up colors, hair colors, and are just prettier. And it just isn’t fair that she got hazel eyes instead of blue like the rest of us. I tried to point out that she has absolutely beautiful hazel eyes and that she has the kind of hair that most dream about. None of this matters because she doesn’t have blue eyes. I was really frustrated by this entire exchange and it’s one that I have relived in my head several times (not to mention my daughter is still fixated on this topic). I started to realize that it is the classic the- grasser-is-always-greener syndrome. Then, I realized with sickening clarity that it is a syndrome that we all fall victim to way too often. When I learned I was pregnant with my second child, I assumed I would have another girl. After all, I knew how to dress, interact with, and raise girls. Of course the universe would give me another girl. And then the ultrasound tech said “it’s a boy” and I couldn’t have been more shocked or horrified. What in the heck was I going to do with a son? I lamented and probably even shed a few tears because having a girl was going to be more fun or easier or whatever it is that my subconscious was thinking. After holding him for the first time, any fears or dismay that I had over having a son disappeared. It wasn’t and it isn’t horrific having a son; it is just different and honestly it is amazing. I think the desire of every to-be parent is to have a happy and healthy baby. In fact, it’s the standard that we dream of and plan for; the ideal that every baby book is written for. It’s the assumption underlying every “memories” book that is on the market at the moment. Anything less is the equivalent of brown and brittle grass; the green grass is over there with the healthy, diagnosis-free children. Learning that my daughter had a chronic lifelong illness or that my son had autism wasn’t anywhere on my mental radar. It was shocking, dismaying, and flat out disheartening; it was also paralyzing because I was focused on the other grass and how to get there instead of joining the scenery and attractions on my side of the fence. Don’t get me wrong, I wouldn’t have planned any of this, but at the same time it only has to be paralyzing and miserable if I am intent on focusing on the grass on someone else’s side of the fence. My daughter has been through way too much medically, but through it all we’ve learned some pretty amazing coping skills that benefit us in all aspects of life. I’ve also learned about other’s life experiences that I wouldn’t have otherwise known or cared about; without a doubt that knowledge has made me a better person. I hate to watch my son struggle, and I doubt I will ever appreciate autism itself, but when I take that out of the mental picture, I have a pretty cool son. He has a quirky sense of humor and some amazing strengths that are unique to him. I’ve truly learned what patience means and I have a perspective now on disability and life-challenge that I could have never gotten third hand. Sometimes I wish I didn’t have all of the perspective that I do, but at the same time I’ve started to realize that grass comes in all shades and textures. The grass on my side of the fence isn’t the same as the grass over the fence, but it is still grass and it is pretty amazing grass when I look at it for what it is instead of what it isn’t. I think maybe that is one of those secrets of life; look at things for what they are rather than what they aren’t. That’s my newest approach for dealing with the blue eye drama; I’m cutting out lots of articles about fabulous hazel eyes and I’m sharing them all with my daughter. Of course if that fails, there are always blue contacts. Sometimes we can change the grass that we have with a little replanting and strategic fertilizer. However you choose to enjoy it, just remember that the crazy really isn’t always greener somewhere else and there is really no place like home. Therefore the grass at home is probably pretty amazing when you let yourself think that way. There is always a really odd push and pull tension in our household; it lays somewhere between autism’s need for constant routine and predictability and primary immune deficiency’s call for spur of the moment (or how everyone is feeling) decisions. One condition dictates that we plan as far in advance as possible so that we can “first,” “second,” and “third” the heck out of anything that is going to happen or just might possibly happen. The other condition strips any ability to plan out of our hands, as a well-child one moment doesn’t preclude a feverish, dangerously ill child the next. The tension isn’t unbearable in our household, though. It is almost as though yin and yang exist, a balance between heat and cold, night and day, crawling and running. Somehow in this mix, Dan and I have evolved as a couple in a way that balances this tension. We’ve gotten to a point in our relationship that almost inevitably one of us feels comfortable taking the lead on a decision and the other feels comfortable with that lead being taken. Or more realistically, I jump into a decision and Dan uses his thinking time to figure out how to get us out of whatever mess that I’ve gotten us into. Sometimes my impulsivity works and other times, well let’s just say that I’m thankful that I have a very, very understanding and forgiving husband. I knew a service dog made perfect sense for Caden the moment I first came across the idea. Dan wanted to do more research and think awhile. He wanted to sit with the information and really digest it all thoroughly. Of course I had the fundraising completed by then and thankfully he saw the wisdom of my decision by the time we headed to 4 Paws For Ability to meet and train with Elf. I honestly don’t think it is a decision that either of us has ever looked back upon, although I really doubt Dan could articulate when he ever said he was on board with the decision either. Then again he is still contending that I coerced him into marriage almost 8 years ago so maybe this memory loss is really just his mode-of-operation. Last October, Ryley woke up with a migraine that to-date hasn’t gone away. The symptoms have instead transformed into short term memory loss, occasional disorientation/confusion, joint pain, fatigue, dizziness, and a whole host of other problems. We are working with a diagnosis of postural tachycardia and potential chronic fatigue and pain syndrome on top of the daily persistent headaches and primary immune deficiency and so on. We have more testing this week and even more coming up in the next few weeks. I learned a long time ago though that medical answers are never easy to come by when you have a zebra so I’m not expecting a simple answer nor a fast solution. This latest round of symptoms has hit my beautiful 12-year- old hard. She is at the age where she is trying to find her own individual sense of self (which by the way seems to be grounded in the direct opposite of whatever I suggest….thank you mom for wishing a daughter just like your own on me) and establish independence. I think we’ve honestly been raising her for this moment, and none of us expected her to be hit so hard mentally by yet another wave of medical conditions. I knew we needed to do something drastic and quickly. Dan agreed and moved into thought and research mode. 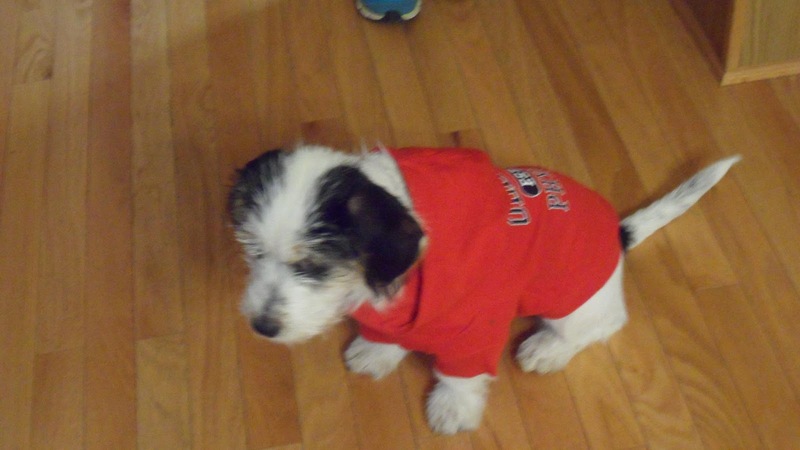 By that time, of course, I had already decided on a service dog for Ryley. And not just any service dog mind you. Ry needs a distraction now--not after fundraising or training is complete in a few years. She needs something that needs her just as much and it helped that she’s been dreaming of being a dog trainer when she grows up. Honestly, I would eventually like to train my own search and rescue dog so it only made sense (at least in Jennifer world) that we would adopt a puppy and train it for Ryley ourselves. And so it was with much delight (or dismay depending on which one of us you talk to) that we adopted Sophie a few weeks ago. And just like that, we have chaos amidst the calm again; a fully trained and operational service dog on one end of the spectrum and a wiggly undignified bundle of puppy love on the other end. A husband who has no idea how he went from enjoying his bachelor days with one dog to living in a furry zoo and a wife determined that she’s on the right course of action for her daughter. Add in a puppy who isn’t quite potty trained and a few ticked off cats and you’ve got the next installment of Caden’s tale. Caden's aware: No need to whisper the "a-word"
As I’m sure you’ve heard by now, April is Autism Awareness Month. Many advocates are claiming that we no longer need awareness that our focus could and should be on acceptance. In theory, I agree. I’d love a world that accepts my child for who is he rather than the label that he has. A world that accepts him for what he is capable of rather than dwelling on what he can’t quite accomplish yet; a world that celebrates his difference rather than critiquing his lack of conformity. But before we can get to acceptance, people have to know and understand what it is that we are asking them to accept. I’m still encountering statements like “but he doesn’t look like he has autism,” and “oh, how did he get that?” on a regular basis (the second utterance actually came from a medical staff member in our local emergency room). Then there are the “oh he is just a little shy,” or the “I guess someone is a tad spoiled” remarks. Let’s not forget the comments about parents wanting a label in order to get “free services,” or the fact we must be “milking the system” because we have a disabled parking sticker for Caden. I wonder if most people really are aware of the 1 in 88 statistics and just how many children that equates to from their own neighborhood or family? Are people really aware of the signs and symptoms of autism (things like language delays or losses, repetitive behaviors, and interactional difficulties)? Do people understand that autism is a spectrum disorder meaning that each and every child and adult will display a different set of symptoms in varying degrees? Do they know what a fight it is to get insurance to cover what few services may be available in your region and what kind of waiting lists usually apply to these scarce resources? Do they believe the myths or do they know the reality of autism? Of course there are aspects of autism, like any other phenomena, that you can only understand once you are living or living with it on a daily basis. I’m not talking about those discrete differences; I am talking about the big picture of autism. I recently had a parent at Caden’s school comment that it must be nice to only have to go to school a half day most days. I just stared at her, struggling to find the words to express how much my child wishes he could stay at school the full day every day. Let’s face it; the fun stuff happens in the afternoons--the birthday parties, the trips to the park, the fun crafts, movie time. Instead of staying and playing at the park with his friends today, Caden had to come home at noon so that he could spend 4 hours involved with in-home therapy that will push his boundaries in speech, occupational therapy, physical therapy, life skills, and interactions. It is 4 hours in the grand scheme of things that will help him have a happier and more successful life, but in the moment to a 6 year old, the only thing that mattered was a trip to the park on the first sunny day of Minnesota spring with his friends. To make amends, his dad played in the park with him for a few minutes on the way home and his last therapist of the day is going to take him to the park to play for a bit, but it still won’t be the experience of lining up and walking there with his friends nor will the play he and his therapist engage in be on the same par as that he would engage in with his friends. And when therapy is finished for the day, we will wait for the police officer to come and change his Project Lifesaver bracelet battery to help keep him safe for another month. The myths about autism would tell you that he doesn’t know or care about any of these things, but I promise you he was crying very real tears of heart break when we left the school today and his face will be showing real signs of fatigue before the day is over. We’ll do the same therapy tomorrow and Friday with Saturday being reserved for time with his peer mentor out in the community. That’s the reality of autism; that’s our everyday experience. 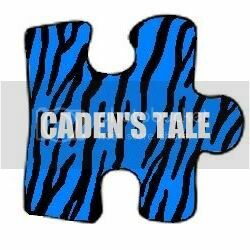 Of course there’s more because Caden is more than autism. There’s also his sense of humor that helps him cope with many situations, his beautiful smile and bright eyes that communicate even when words escape him, and his loveable personality that endears him to those around him. There’s his love for Super Mario, Angry Birds, and anything Wii as well as his adoration of his Packers blanket and his attachment to his IPad. But autism is a huge part of each and every day and an even bigger part for him. When we go out to restaurants or to the store, we can’t leave autism at home. Sometimes it is loud and in your face and other times it is sweet and huggable, but it is always present. We can’t take it in and out of our pockets at will and we can’t wait it out at home like a virus. So that child that you love to talk to at school is the same child screaming on the playground because he couldn’t handle the birthday song at your child’s party. The child who gives you a sweet smile at the doctor’s office is the same child sitting in the middle of the WalMart aisle rocking with his hands covering his ears. He’s not shy, he’s not spoiled, he’s not bad--he just has autism. Autism isn’t a secret or dirty word in our house; we talk about it openly because it is a part of our family now. Caden knows his autism makes some parts of school harder for him and some parts of school easier for him. He knows his autism makes him really good at computer games and talking about emotions really hard. You don’t need to whisper it, but you do need to acknowledge it. Once people know what autism really is, then we can talk about acceptance. One step, one day, one face at a time.